Not my favorite spring weather report. It started before dark, with just enough light for us to watch the ground turn white again. But, cool beans. There was also just enough light to watch about 8 of my favorite spring visitors. The fox sparrows were hopping back and forth on the ground to find food, leaving little green patches where they had cleared the fresh snow. I love these jumpy little birds. 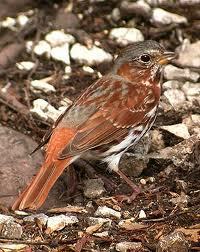 They are easy to identify from other sparrows because they are slightly bigger. They are fun to watch and their song is a delight to hear. (Click here for a link to hear it. Scroll down to “typical voice” on the left.) They are not around for long as they are just passing through on their trip north to Canada. 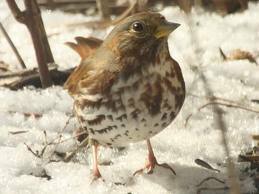 Even when it snows, they are a definite sign of spring. sweet birdie! she has a good shape! No 8″, more like 4″ but it’s 8 a.m. and still snowing. At least it’s light and fluffy. 2 hour delay for schools on the mainland. Only 3 more days for you and me! Spring in Maine..gotta love it! Amazingly, so far this year I DO love it. I’m shocked at how fast my least favorite month has been going! Beautiful birds! I’ve never seen that kind of sparrow before; guess Texas is way too far south for them. Hope the snow stops soon and spring comes quickly. It’s still “springy” for here. Even with the snow. It’s already melting and the roads are bare. 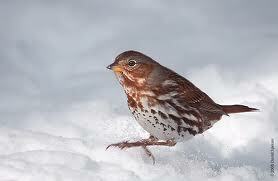 It looks like the Fox Sparrow might winter in eastern Texas.